This chicken brooder enclosure comprises a set of 8 plastic panels which interlock to form an enclosure about 34" (860mm) in diameter. Suitable for use with any poultry or game bird brooders to confine young chicks, pheasant, quail and other gamebird or ducklings, waterfowl, etc. 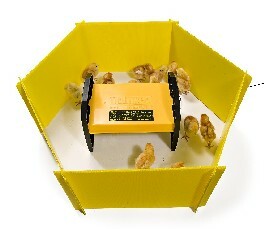 Ideal for use with the EcoGlow chicken brooder as shown. Hygienic, great for hatching in the classroom.